At Historic Summit, Security Council Passes Resolution to Limit Nuclear Proliferation | Democracy Now! Executive Director of the Lawyers’ Committee on Nuclear Policy. JUAN GONZALEZ: The United Nations Security Council held a special summit Thursday to discuss nuclear nonproliferation and disarmament. It was an extraordinary meeting on another front. President Obama became the first US president to chair a UN Security Council summit, and the meeting marked only the fifth summit-level meeting of the council in its sixty-three years of existence. The Security Council unanimously passed a resolution aimed at shoring up the international commitment to limiting the spread of nuclear weapons. While the resolution did not mention Iran and North Korea, several world leaders, including President Obama, referred to the nations in their remarks. PRESIDENT BARACK OBAMA: We’ve made it clear that the Security Council has both the authority and responsibility to determine and respond as necessary when violations of this treaty threaten international peace and security. That includes full compliance with Security Council resolutions on Iran and North Korea. Let me be clear, this is not about singling out individual nations. It is about standing up for the rights of all nations who do live up to their responsibilities. JUAN GONZALEZ: The US-drafted resolution calls for further efforts to achieve “a world without nuclear weapons.” But critics of the resolution said it failed to include mandatory provisions that would have required nuclear weapons states to take concrete disarmament steps. The resolution also lacked any call on nuclear states to halt production of fissile materials for nuclear weapons. We’re joined by John Burroughs, executive director of the Lawyers’ Committee on Nuclear Policy. He recently met with several UN missions of Security Council members regarding the summit. JOHN BURROUGHS: Yes, good morning. JUAN GONZALEZ: Well, your reaction to this unprecedented agreement? JOHN BURROUGHS: Right. Well, it was really an astonishing time. It was the first time that heads of states have gathered to address the question of nuclear weapons, just on its own. And it was a time when President Obama was following through on his April 5th, 2009 speech in Prague, where he declared the goal of achieving a world free of nuclear weapons. And he said some very strong things there. He said that as the only nuclear power to have used nuclear weapons, the United States has a responsibility to act. So the Obama administration was showing we are determined to go forward with acting. And the resolution did call for a ratification of the Comprehensive Test Ban Treaty. It did call for negotiation of an agreement banning production of fissile materials for weapons. It did welcome US-Russian talks on reductions. But, as you said in your introduction, it really was not transformational. It was more, in a sense, a sort of an affirmation of the existing agenda, and that includes Security Council action and resolutions over the last decade or so aimed at stopping the spread of nuclear weapons and preventing their acquisition by terrorists. And the resolution, in fact, had a few new wrinkles in that regard. JUAN GONZALEZ: What about the issue that the following day, then the President — or the Times, New York Times is reporting now that the Obama administration is — will be accusing Iran of having a secret production facility, an underground production facility? JOHN BURROUGHS: Boy, that’s big news. I didn’t catch that. 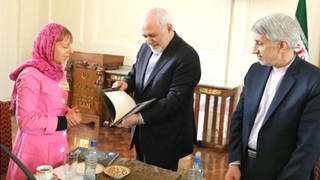 What’s happening with Iran is that there is a meeting of the permanent five members of the Security Council, plus Germany, the United States included, early next month, and it seems that the plan is, if Iran doesn’t agree to limits on its nuclear program, that the United States is going to push for strengthening already fairly serious sanctions against Iran. Frankly, you know, I’m not sure this whole approach is going anywhere. And one of the things that came up, interestingly, in the discussions by the leaders in the Security Council was the fact that both Iran and North Korea have been ignoring or defying Security Council resolutions over the past few years. And as Obama and the French leader and others were indicating, this calls into question the effectiveness of the Security Council. One of the things I think that needs to happen is the Security Council has to become more representative of the world. Why aren’t, you know, India and Brazil and Indonesia — why don’t they have some status in the Security Council, as well? I think that would make it more legitimate with respect to questions like Iran and North Korea. However, there was no mention of such changes yesterday. JUAN GONZALEZ: And the issue of, obviously, that there are no —- nothing is mandating any of the governments to begin a process of either reducing, those who already have nuclear weapons, or stopping any kind of development efforts in terms of nuclear weapons? JOHN BURROUGHS: Well, the entire resolution was in the form of calls, welcomes, urges, encourages; it didn’t have any mandatory provisions at all. This is in contrast to resolutions that have been adopted regarding Iran and North Korea and terrorists over the past few years. So it wasn’t only on the disarmament part that it wasn’t mandatory. JUAN GONZALEZ: What does the resolution say about those countries that are not part of the Nuclear [Non—]Proliferation Treaty, countries like Israel or, you mentioned, North Korea, India and Pakistan? JOHN BURROUGHS: Right. Well, North Korea has announced its withdrawal from the treaty, but that’s still subject to negotiation as part of the six-party talks. But one of the disappointments about the resolution was that it did not include any reference to the need to achieve a zone free of nuclear weapons in the Middle East. This would not have been a new step; it’s something that the Security Council itself has called for in the past. It’s something that’s been called for in the context of the Non-Proliferation Treaty. But no mention of it, despite the fact that President Obama spent a lot of time in his speech to the General Assembly on Wednesday talking about the Israel-Palestine conflict and bringing that to an end. So, that was lacking, the nuclear weapon-free zone in the Middle East. There was a call on all the countries outside the Non-Proliferation Treaty to join it. That’s sort of pointless in the case of India and Pakistan. They’re going to see — have to see progress towards global elimination of nuclear weapons before they’re going to really want to play ball. JUAN GONZALEZ: And in terms of — how dramatic a change is US policy now on this issue compared to the previous administration? JOHN BURROUGHS: Oh, it’s a new world. It is a complete reversal of Bush administration positions on a wide range of fronts. And there’s the very strong commitment to notions of cooperation and international rule of law. As I’ve already indicated, so far, the concrete measures that the Obama administration has been talking about, they’re just — they go back to Clinton administration positions, the Test Ban Treaty, the Fissile Materials Treaty, US-Russian reductions. So, in that sense, it’s been sort of a resuscitation of Clinton administration positions, but I think the potential is there for much more. JUAN GONZALEZ: And in terms of where this resolution goes from here? Is there any — are there any planned UN actions after this at all? JOHN BURROUGHS: Well, the Security Council said in this resolution that it remains seized of the matter, but they did not establish a subsidiary body, you know, a committee of the Security Council to deal with these matters. They didn’t say, “We’re going to meet again at a certain point.” I think we’re probably going to see some follow-up in the Security Council at some point, but the next big step is the Non-Proliferation Treaty review conference next spring. JUAN GONZALEZ: Well, I want to thank you very much for being with us, John Burroughs, executive director of the Lawyers’ Committee on Nuclear Policy.